I know I've shared this before, but mornings are a whirlwind of crazy for me. Flipping through my clothes in the closet, throwing all of the outfits that didn't make the cut on the bed, ironing the outfit that did make it, making lunch (and sometimes dinner too! ), doing the hair + makeup, getting out of house on time - I mean, you all get it because we're all doing the same mad getting-ready-before-work dash, right? What I rarely do is sit down and eat breakfast, because I'd rather stuff something in my face while I'm doing something else to save on time. 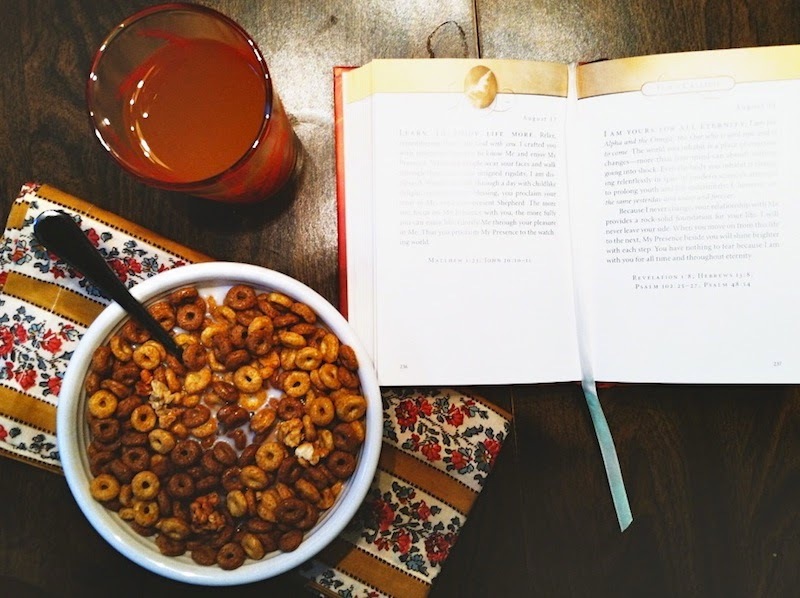 Yesterday morning, though, I sat down with a bowl of Cheerios Protein Cinnamon Almond and my Jesus Calling and let myself eat slowly while I filled my mind with some truth before starting my day. I hate how rushed I feel in the mornings, so taking the time to actually sit and eat was a nice treat. Do you take time in the mornings to sit down and eat breakfast?